On August 9, 2014, Michael Brown was shot at least six times and killed in an extrajudicial killing by Officer Darren Wilson, of the Ferguson Police Department. 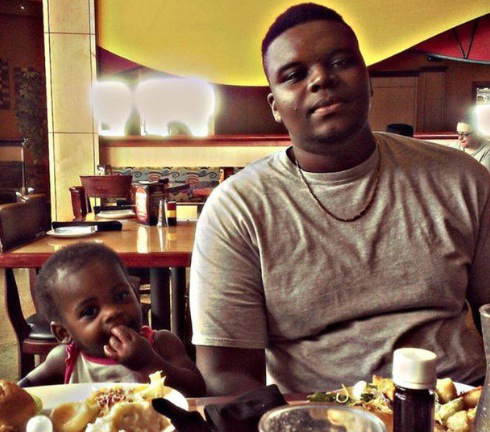 Michael Brown was African-American, 18-years-old, and he was unarmed. Let me repeat that for you: he. was. unarmed. While eyewitness accounts are fairly consistent, police have released conflicting stories on his death — first he robbed a convenience store, then he jaywalked. Regardless, there is no reason why an unarmed man should be shot and killed without due process. Despite being in a country where there is a well established legal system, it seems again and again that the rules of “innocent until proven guilty” and due process don’t seem to apply to people of color. Since Michael’s death, protests have erupted in Ferguson. Communities are angry and they’re devastated. Nationwide, communities have rallied in solidarity with Michael Brown’s family and the people of Ferguson. These constitutionally protected protests were brutally suppressed by a terrifyingly militarized police force. So much so that Amnesty International sent human rights observers to the protests, marking the first time the organization has ever sent human rights observers to the United States. We at Disrupting Dinner Parties are horrified to see such blatant disregard for human rights and complete disrespect for black lives and dignity as these events unfold. We are mobilized to act and we hope you are, too. You can read this piece in its entirety or jump straight to the sections you care most about using the links above. Media narrative falls into one of several camps; dehumanizing pieces reducing largely peaceful protests to rioting and looting, complete radio silence, or actual journalism. Part of this is due to the arrest, detention, and removal of constitutionally protected press. Much of the honest news about the Ferguson protests is coming out on Twitter, Facebook, and Vine — not conventional news sites. The news we do get depicts an altogether terrifying picture of suppression of both peaceful protesters and legal press. People on the ground and insightful updates: @AntonioFrench, @Nettaaaaaaaa, @Awkward_Duck, @akacharleswade, @FergusonUnity, @ShaunKing, @RyanJReilly, @elonjames, @PhilofDreams_, and @MoralesWilliams. News Sites: The Root, Colorlines, News One, The Huffington Post, Vox, and Al Jazeera America. Archived live stream clips from The Color of Change, updated regularly. It’s important to see Michael Brown’s death and the protests that followed within their larger context. The people of Ferguson, MO aren’t just angry because a teenager was murdered, although that would be enough. This pushback is happening in the broader context of centuries of racism and structural inequality. “Things to Stop Getting Distracted By When a Black Person Gets Murdered By Police” by Mia McKenzie at Black Girl Dangerous. “The Murder of Black Youth is a Reproductive Justice Issue” by Dani McClain at The Nation. Black women and girls are also victims of police brutality. Rekia Boyd, Yvette Smith, Tarika Wilson, and Aiyana Jones are just a few of their names. Read their stories, see their faces, fight for their justice, too. 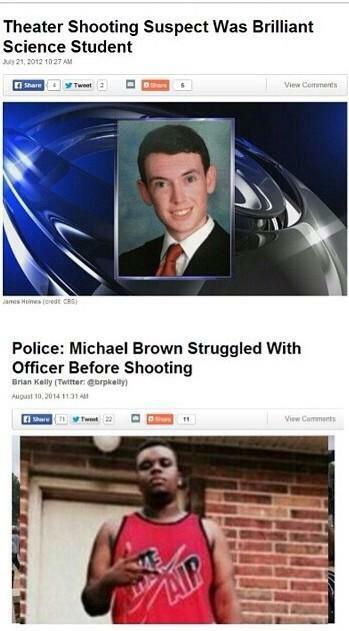 #IfTheyGunnedMeDown, a twitter exploration of the portrayal of black victims of police violence. A comparison of how James Holmes — a man who murdered 12 people and injured 70 — and Michael Brown are portrayed by the media. Tell me again how there isn’t any bias in media representation of people of color? “7 Disgusting Ways Michael Brown and Ferguson Have Been Smeared” by Steven Rosenfeld at Alternet, Republished on Salon. John Oliver’s magnificent, 15-minute rant on Ferguson, racism, and the militarization of the police. “How America’s Police Became an Army: The 1033 Program” by Taylor Wofford at Newsweek. 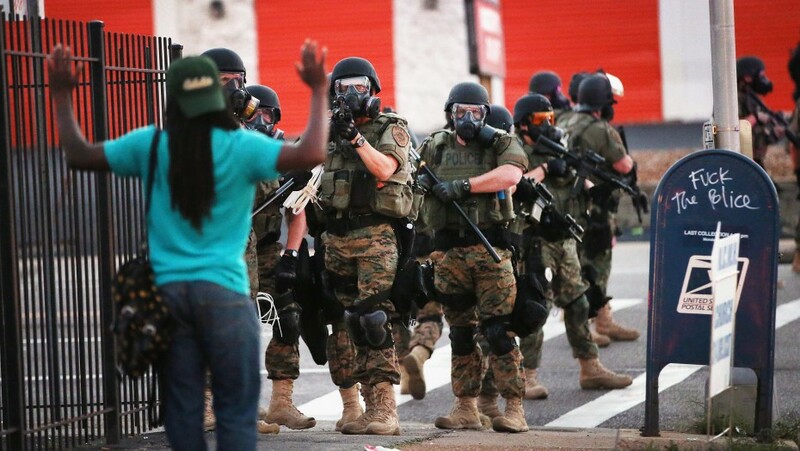 Police get military equipment, but not training — making the gear even more dangerous. “How to Deal with Friends’ Racist Reactions to Ferguson” by Jenée Desmond-Harris at The Root. “Ten Things White People Can Do About Ferguson Besides Tweet” by Kate Harding at Dame Magazine. “I Don’t Know How to Talk to White People About Ferguson,” by Ali Barthwell at XOJane. Take the time to read “The Case For Reparations,” by Ta-Nehisi Coates and start to wrap your head around the deeply entrenched history of racism and black oppression in the United States. Started by Georgetown University professor Dr. Marcia Chatelain and with contributions from teachers across the US, a #FergusonSyllabus and an accompanying resource document for teachers looking to educate about the historic, economic, social, and political context behind the events in Ferguson. The references are indispensable for anyone looking to get more information about Ferguson and the context behind racism in America. Volunteers on the ground only in the following areas of expertise. To connect with local activists, please fill out this form. If you’re a medic, attorney, counselor, photographer, videographer, organizer of color, tech person,please fill out this form and come to Ferguson. The Bail and Legal Defense Fund for Justice for Mike Brown — many people have been arrested in the Ferguson protests. This fund was set up to contribute legal assistance not only to protesters, but to all people in jail and relieve an overburdened public defender system. Support for Michael Brown’s has been set up into two funds — one to help his family with funeral, travel, and living expenses as they seek justice for their son, and another to help Michael Brown’s siblings receive psychological services to help them cope with this tragedy. Support local organizers on the ground such as the Organization for Black Struggle, an organization with 35 years of experience of anti-police violence work, which is looking to hire a community organizer in Ferguson. The #HandsUpDontShoot Campaign Infrastructure Fund, supporting movement building in Ferguson. Support organizations such as the Southern Poverty Law Center and the ACLU that do civil rights and anti-oppression work every day across the country. Check out the amazing Police Brutality Action Kit put together by Showing Up for Racial Justice, complete with action items broken down by levels of commitment. Attend a local demonstration, non-violent protest, or solidarity rally. Call your elected officials and ask them what they’re doing to support racial justice in Ferguson and throughout the US. The events in Ferguson are a rallying cry for us all to take action against the pervasive structural racism and violence faced by black communities in the US. It can feel overwhelming and difficult to find your place in a movement if you’re joining it for the first time. However, it is our hope that we have collected ways for even the most uninformed to learn more and take action, in whichever ways they are able. Of course, this is not an exhaustive list. Do you have an opportunity you’d like for us to add to this collection? Let us know in the comments. Duly noted and added to the list! Thanks! Rachel Maddow had a couple great video segments on Ferguson as well. Too bad The Daily Show is on vacation. Thanks for sharing. TURNING STONEchoice touched on this also – When Will It End? Please check it out http://turningstonechoice.wordpress.com/ . It is important to make empowering and purposeful choices. This post is not about Mongolia, or my travels therein, or even my experiences elsewhere. I know that this is not what you come to my blog to read. But it’s too important not to share.